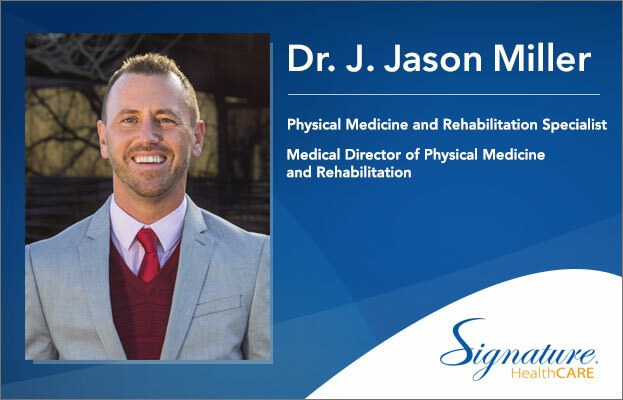 Dr. J. Jason Miller, a board-certified Physical Medicine and Rehabilitation Specialist, is Signature HealthCARE’s Medical Director of Physical Medicine and Rehabilitation. Dr. Miller came to Signature HealthCARE from Elmcroft Senior Living where he was Chief Clinical Officer and Department Director of Physical Medicine and Rehabilitation, overseeing the development and implementation of the rehabilitation program for six of Elmcroft’s Louisville-based facilities. Dr. Miller earned his Doctor of Medicine from the University of Louisville, where he completed his residency training in Physical Medicine and Rehabilitation. During his residency, he received the Gold Foundation Humanism and Excellence in Teaching Award. He still currently serves as a Clinical Instructor for the University of Louisville Department of Physical Medicine and Rehabilitation. A physiatrist, also known as known as a Physical Medicine and Rehabilitation Specialist (PM&R), treat a variety of medical conditions that affect the brain, nerves, spinal cord, joints, ligaments, tendons, and muscles.